Westeros is on the way. 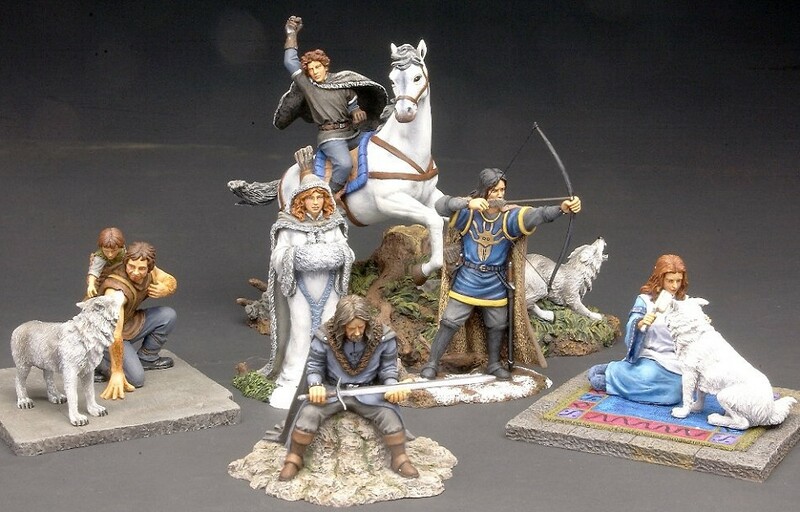 The Testor’s Corporation of Rockford, Illinois is moving full speed ahead with its plans for three lines of miniatures based on A Song of Ice and Fire. The initial release will be a group of resin miniatures cast and painted in China, and made in the large 1/18 scale. We had originally hoped to have the first figures out in late 2005, but Testor’s decided to take a little longer than initially planned, to make certain the miniatures would be top quality. The first prototypes have just made their way from China to Illinois, and here’s a advance peek. Yes, some of the colors are a little off — the direwolves should be greyer, and Theon should be in black, not blue. This is just to give you a taste. These are just prototypes, remember. All the little glitches will be fixed before we go into production, so there’s no need to write Testor’s, or me. In fact, all of you need to do is run down to your favorite toy and hobby shop, and make sure they will be carrying the figures when Testor’s releases them early in 2006.